At first, I’m not altogether sure what she’s talking about. 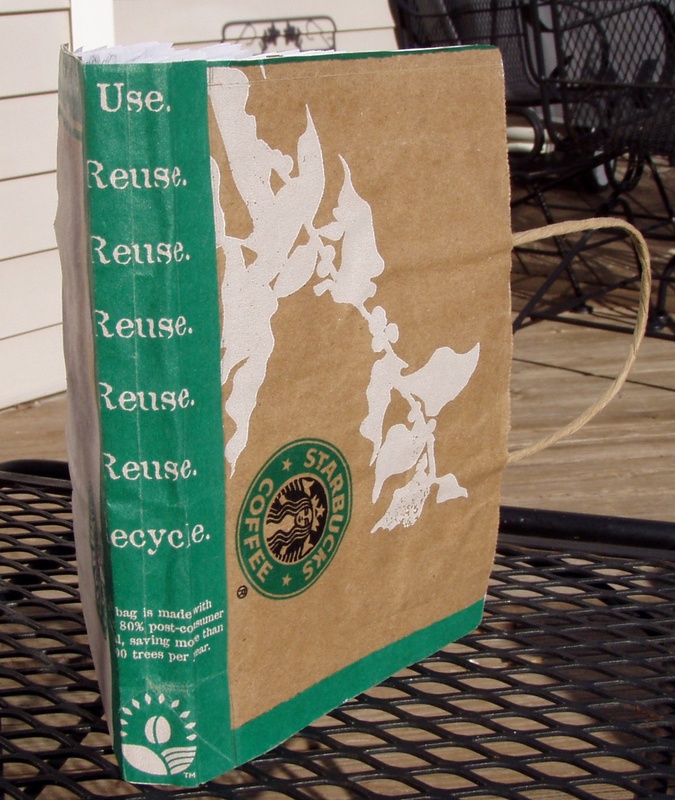 But slowly it dawns on me, that she has this OH SO COOL idea to recycle a Starbucks bag into her very own journal/sketchbook complete with handles! How cool is that!?? Her eyes are glazing over. I know my daughter. At least what I know is this: she is amazingly creative, makes things and crochets fabulous stuff without any patterns, has incredible ideas but not quite as much patience or endurance, being 15 and all:). So I admit to her, that I myself (who also doesn’t have a huge store of patience for tedious projects, being 44 and all:) found the sewing to be a bit taxing on my stick2itiveness last year when I made a small book filled with watercolor paper. I suggest to her to find an alternative way. We toss around a few ideas, toss out a few others, and then she disappears. 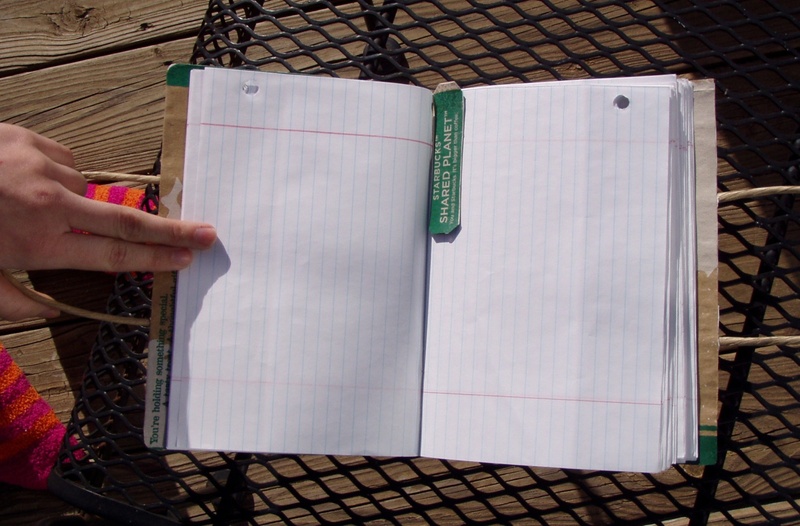 Each signature of regular notebook paper was stapled to a piece of the Starbucks bag she cut in the shape of a “spine”, with about an inch or so extra on each side of the spine. She stapled these signatures to the “spine” along the middle fold line inside each signature. 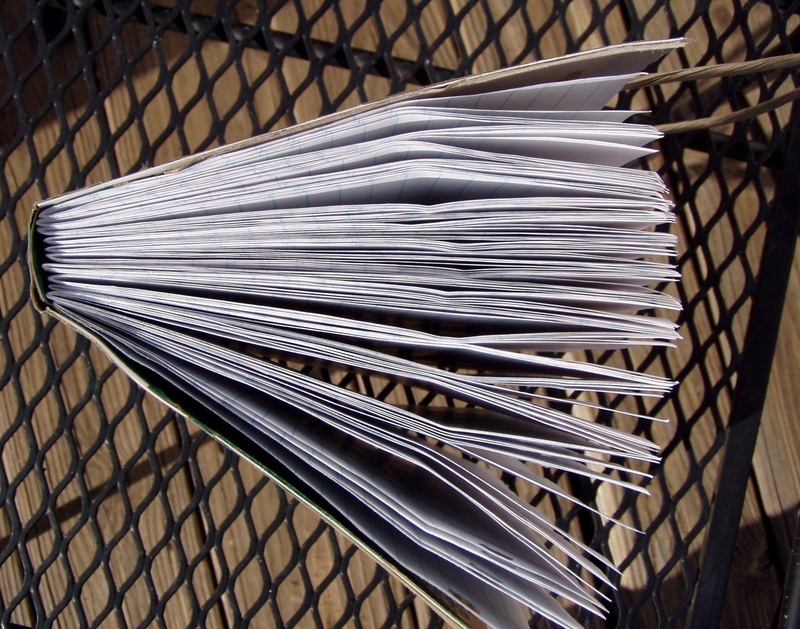 She did say this was a bit tedious since she was using a regular length stapler and had to curl under a portion of the notebook paper in order to staple them to the spine. She stapled each signature side-by-side to the “spine” as closely as she possibly could. A long-armed stapler would have made this much easier! Then she made the front and back covers from the parts of the bag that had the handle because she wanted a “carrying journal” (totally cool!) She used a bit of posterboard glued to the front and back parts to make it more sturdy. She then glued the front and back onto the extra inch on either side of the “spine”. After this dried, she then lined the inside of each cover and lined the outside of the “spine” to cover up the staples. She even made a bookmark to go with it. Is this not a really clever idea???? Or am I just a proud mom? Excellent idea. You have a right to be proud of your creative daughter. A totally cool idea! How creative and innovative! I also LOVE your “Making Table”. I wish I had been so smart when my kids were still growing up. Genius!!!!!! 🙂 This one must be submitted to some creative invention/creation contests to bag some medals! It *is* a clever idea. Hmmm… those possibilities! That is SO cool and SO SO practical! I love the idea of the handles. Oh! You must be so proud! 🙂 It is a beautiful sustainable design. WAY cool!!! Makes me want to sit in a Starbucks drinking coffee and sketching in a book as cool as that one! Very cool idea! Re the stapling: Open up the stapler, as though you were going to staple something to the wall. Get an eraser and put it underneath where you want to staple the signatures. Using the open stapler, staple your signatures so the staple goes through your signatures and then into the eraser behind them. Pull the eraser off and bend the ends of the staples down with something hard like the end of a spoon. This way you don’t have to work to curl your pages to fit into the stapler arm, and you don’t have to shell out for a long-reach stapler. I recently finished an art journal made from Trader Joes paper bags. It turned out just so cute. I painted on some of the pages with acrylics and some I left just brown with some frames of colorful paper around the edges. It was so much fun to play with. Your daughter is just so artistic. It looks like she is on her way. Congratulations Proud Mama. Wow! Your daughter is brilliant! What a fantastic idea! I think we should all make a version and post it! You have every right to be proud of your creative daughter! I’d suggest to patent the idea, brilliant !!! You should be a proud Mom, this is a totally awesome book!! Your daughter was very creative and extremely clever both with the concept of the book and her solution for securing the signatures. She is very lucky so have a supportive mom who kows her so well and encourages her. I wish I had a Mom like you when I was growing up!! That is so awesome. I just love how the spine says reuse all the way down. I really want one. 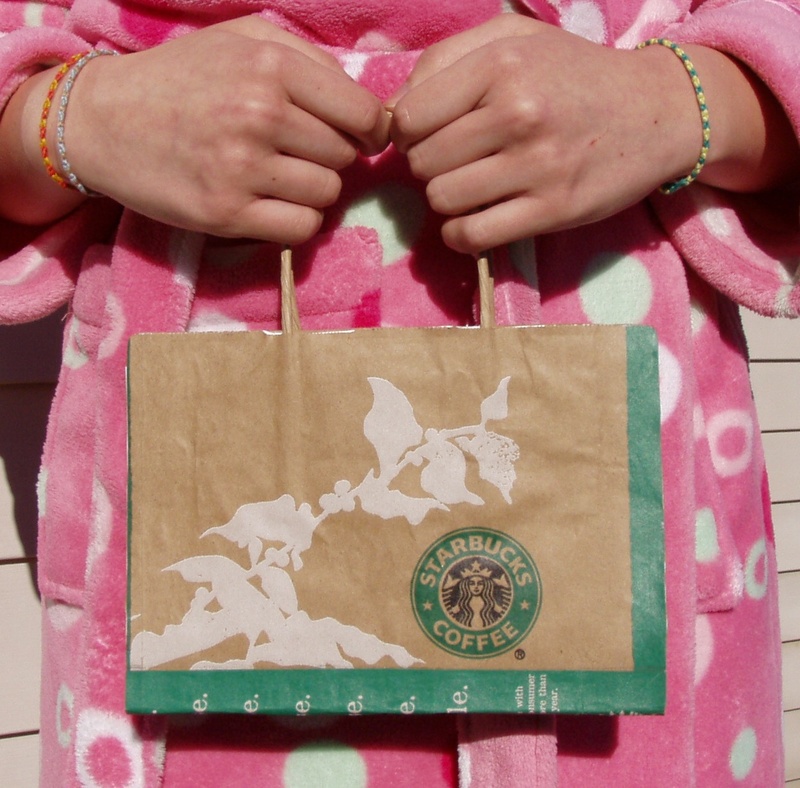 I wonder if Starbucks will just give me a bag to play with! My daughter is a little older and has an Abercrombie bag….She would be the hit of her friends!!! LOL!!! Thanks for the idea and tell your daughter she did a wonderful job! Thank you EVERYONE! I have read each of your comments to my daughter…she has been so tickled by your enthusiasm and encouraging words! How wonderful! What a clever girl you have there. Ok. I am craft challenged. My idea of being craft-y is to lay pine-cones on a newspaper and spray paint them gold! That was in 1995! Knitting is out because I can’t count and remember at the same time… I fool around with modern art. I paint in the park and as people walk they say, “Look an artist and they walk up and say, “Oh…” I like to experiment with negative space and white space. I like to do blind contour drawing of objects and then fill in the space. The drawings appeal to me because of their simplicity. When you talk about the book and signatures do you mean pages? Also, how do you like this for a website site? Do you feel like your material is protected as in ideas being stolen? I’ll look more, but can you separate your site into knitting, painting, etc. That is my problem on facebook. I have a lot to write about, but it is all in notes and not organized very well.